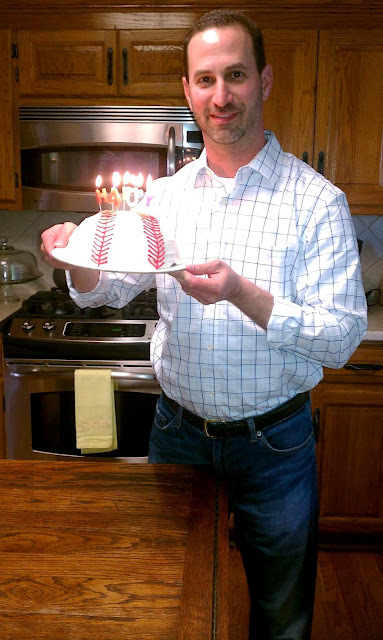 This past weekend, I hosted a small BBQ honoring my husband's 40th birthday. I blogged about this occasion last week and provided a few inside details on what might take place at the party. Well, needless to say, it was great time with family and friends, however the weather turned cool and overcast. Not great photography weather, so I'm providing a few highlights. Hopefully, we will be able to entertain outdoors a little more this summer so you can get the full on backyard experience! These glass pieces are always my tables center piece, but I wanted them to my focal point. So, to add a little something extra to just clear canisters and food, I went with color coordinating candies. 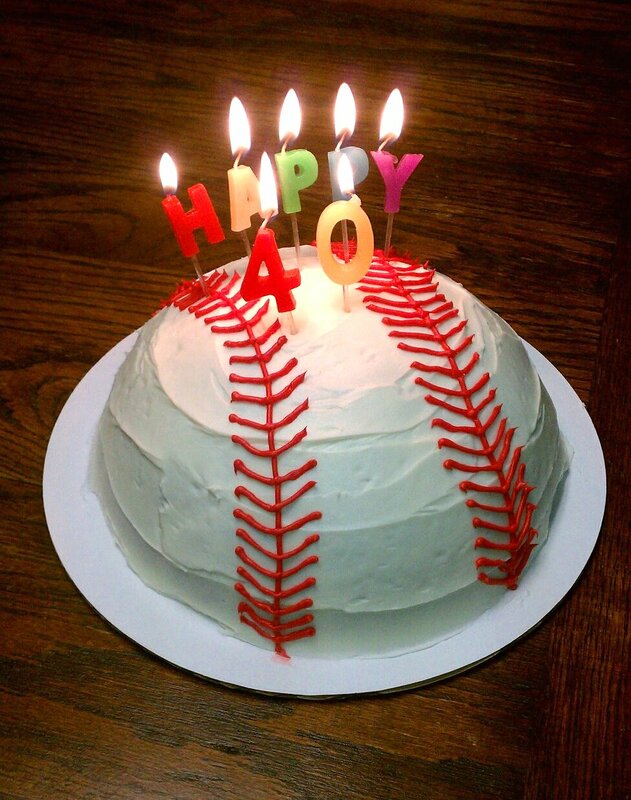 And, because his birthday cake was a baseball earlier in the week, I added cute little foil covered chocolates as well. Around the table, my serving pieces were shades crystal, white and blue to keep with the color scheme of the party. An assortment of colored candies add decor without expense! I love to serve off of acrylic plates. I find them sturdier than paper and there are so many colorful ones to chose from these days. I actually have several sets in fun colors and designs. I also have a full set of white when I want to keep everything else colorful. However, this time I wanted full on color and stacked every other plate with stripes then solids! I found this darling divided silverware holder at Target last summer. Made of aluminum, it holds gobs of stuff and napkins are placed in the larger slot in the back. I also used royal blue Solo cups for beer and clear cups for wine. Adding fun plates is just another small detail your guest will love! For dessert, I wanted to provide our guests with several options so I created a mini dessert bar. Vanilla cupcakes with homemade buttercream icing in royal and powder blue, lemon cakepops decorated with sanding sugar, sprinkles and swirls of white and blue and the ever popular S'mores! They were hit with everyone! The red cooler from Kmart was a tremendous asset to the patio. Again, photos weren't captured, but everyone loved the retro inspired piece. My major complaint was that the lid had a huge dent in the top upon opening the box! We turned it toward the back and just plan to pass it off as a wild party incident! I just can't wait for more parties this summer so that I can get these things on "film"! At the end of the evening, after all the food was consumed, several games of Corn Hole were played and the fire started to smolder, friends headed home with hopefully full tummies and a fun memories. My husband thanked me for his party to which I said I could never have it let it go unnoticed. I guess a non-birthday party is better than any real party I could have thrown! A little light reading. Fun reads that are quite insightful. This post is self explanatory as it is all things Tori Spelling! I discovered her reality series when flipping channels one weekend. A marathon of Tori & Dean: Inn Love was playing and I found myself watching episode after episode. My husband watched too! From that moment, I was hooked. I set the DVR on Oxygen and I haven't stopped recording. I even watch reruns! Tori & Dean: Home Sweet Hollywood is hopefully coming back for a seventh season, and with it, will possibly bring the newest addition to the Dean clan, baby number four! I've said this numerous times. Tori was what inspired me to become a mother. I remember the episode clearly. Tori, Dean, Liam and Stella were sitting on the bed, Liam laying between them and Stella crawling around them. That family moment struck a cord. A year later our own son was born! I've read all the books, watch her on HSN while shopping online for her jewels, and now I'm turning my attention to adding a little more style to my every day life with the help of "celebraTORI"! I've read the forward and it's totally Tori. I love how real she is in her writing. Its as if you are having a conversation with her. Something I would love to add to my bucket list. Can you imagine a Q/A with her and Mehran Farhat? I can see (read) it now! I find Tori to be inspirational. A business woman, a crafter, a DIY enthusiast and most importantly, a mom. She is someone I strive to be like. Successful without being a diva. Successful with what makes her happy in life. Successful in providing for her family without compromising time away. And successful in being a mentor without even knowing she's doing it! Just a few of my fav Tori Spelling pieces from HSN. And who can forget my homage to Tori! Joel and I as Tori and Dean, Halloween 2009. What is a style icon? In my personal definition, a style icon is someone who stands the test of time as fashion evolves decade after decade. They are the person you turn to when compiling your own wardrobe or putting that "it" look together. You can have one or ten, but for me, I currently have only two. Let me rephrase that. I have a cagillion, but when I look at today's celebrity fashion icons, I have two. I feel that I have many facets to my style profile and these ladies help me put it all together! I adore Jennifer and her personal style. From the red carpet to her daily casual looks, she is always pulled together and simply polished. Some of her style staples include jeans, Pashmina scarfs, blazers, a basic tee and her signature beach waves. Her red carpet style is an LBD; fitted and super sophisticated.